Wembley Stadium has lost out to Real Madrid's Bernabeu Stadium in its bid to host the 2010 Champions League final because of tax reasons, says Uefa. Wembley was discounted after failing to provide assurances that players competing in the final would not be taxed by the British government. "Yes, the reason was the taxes," said Uefa president Michel Platini. Rival bids from Munich and Berlin were also overlooked, while Arsenal lost out to Hamburg for the 2010 Uefa Cup final. 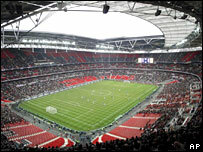 An FA spokesman told BBC Sport: "We believe that Wembley is a very compelling bid and Uefa have acknowledged this. "We are hopeful that the tax situation can be resolved to Uefa's satisfaction before the final decision is taken." A British Treasury spokesman said in a statement: "The UK has hosted many sporting events in the past and there has been no change in the tax rules or the way they are applied. "There appears to be some misunderstanding here and we will obviously be speaking to Uefa to clarify the position and reassure them that the rules have not changed." Uefa was also set to announce the host of the 2011 finals on Friday, but have delayed to further consider the bids. And Platini's advisor William Gaillaird said that would give Wembley a chance to provide more definite assurances over the tax issues, should they choose to. "It gives them the chance to provide the necessary answers to the tax question," he said. "Clearly Wembley is an outstanding venue." A Uefa statement read: "The home stadiums of Real Madrid and Hamburg were chosen on the basis of capacity, facilities, accommodation and security, among other considerations." But Platini added: "The concerns we had over players being taxed were minimised by the English FA but not confirmed by the British government." Uefa maintains that footballers should be taxed in their country of domicile and that taxing them separately in every country in which they play matches would be both unfair and unnecessarily complicated. Platini said Uefa had received assurances from the German government that it would not tax visiting players if the finals were awarded to Berlin's Olympiastadion or Munich's Allianz Arena. Spain's two bids, involving the Bernabeu and Valencia's Mestalla stadium, were not affected as there is no such direct tax law in Spain. The Bernabeu, now boasting a 71,569 all-seater capacity, previously hosted the final in 1957, 1969 and 1980 and their selection comes four months after Uefa conferred 'Elite Stadium' status on their ground, an essential condition for hosting European finals. This year's final will be held at the Luzhniki Stadium in Moscow, with Rome's Stadio Olimpico hosting the match in 2009. Wembley, which last hosted Europe's premier club competition final in 1992, remains on the shortlist for the 2011 final. England last hosted the Champions League final in 2003, when AC Milan beat Juventus on penalties at Old Trafford.